mods:extent 1 gouache; 15.5 x 10.5 cm. mods:abstract One of a collection of 74 original mounted gouache drawings signed and dated 1802 by Langendijk of uniform groups and figures. 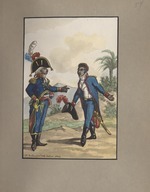 Two black soldiers in red, white and blue. mods:note 4to; 3/4 red morocco stamped and tooled gold and marble boards; fine condition. provenance Hamburg, Koch auction, '74. NGGGdm.